KC Cubs Animal Safari Road Educational area rug is perfect for children's bedroom and play area. The 8 x 10 learning carpet size is great for a nursery, daycare, classroom and kindergarten. It promotes make believe play, interactive play and cognitive play. With over 60 animal and 4 different animal habitats your child's imagination will run wild. Goes great with toy cars like Hot Wheels and Matchbox which your kid can race through the streets. It is made of excellent quality polypropylene and has a low pile which makes cleaning the rug a breeze. 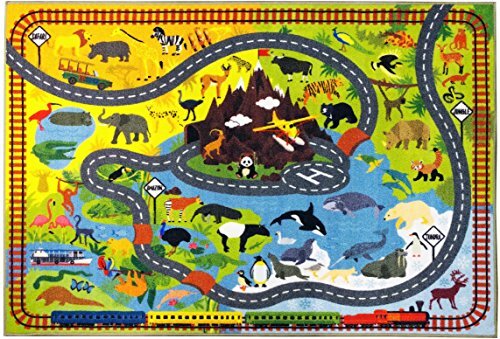 Thanks to its non skid latex rubber backing KC CUBS Playtime Collection Animal Safari Road Map rugs creates a safe play area for your child to play out his own scenarios with his favorite animals. Latex rubber backing, low pile, fade and wear resistant machine-made polypropylene. Includes 4 different animal environments: Tundra, Jungle, Safari, Amazon. Complete with a mountain, river, roads, bridges, a heliport, train tracks and much more. The 8 x 10 size learning carpet is a great fit for any preschool, kindergarten, elementary school, daycare or your town library. Made in Turkey. Fun and educational rug. Great for make believe game play. Perfect with Hot Wheels and Matchbox cars. If you have any questions about this product by KC CUBS, contact us by completing and submitting the form below. If you are looking for a specif part number, please include it with your message.